Choose a group of five or six letter flash cards to work with. Set them out face up and invite the student (or group of students) to identify the letter and picture on each. Have them close their eyes while you remove one of the flash cards and, when finished, invite them to guess which card was taken away. This activity is best used during one-on-one instruction or in a small group setting. Use the flash cards for a scavenger hunt! If your classroom has labels (i.e. clock, desks, etc. ), have your students identify a particular letter in the words found around the classroom, invite students to find objects in the classroom that start with a particular letter, or write a sentence on the board (perhaps from their favorite book) and have students "hunt" for and underline a particular letter. 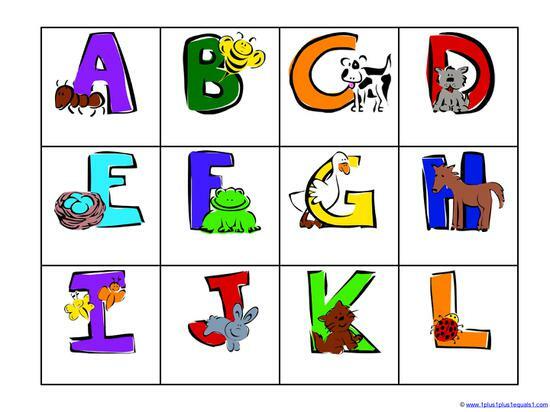 For more advanced students, invite them to try putting the alphabet flash cards in order. You might consider doing this on a smaller scale by offering the student four or five letters at a time to place in order. Carisa also shares some great activity suggestions so be sure to read her full post when you visit her site for the download! The alphabet flash card set featured includes only upper-case lettering. Consider creating a second set of lower-case alphabet cards for exposure and fun matching practice. Along with case, you may wish to analyze the card objects (e.g. in Carisa's set there is an ant on the "A" card). Consider making sure your two sets of flash cards (upper- and lower-cases) capture all the long/short and hard/soft letter sounds. It may seem like an advanced concept, but if you're making them anyway, every bit of exposure counts!